Dr Derek Peterson to deliver Public Lecture at AIU: Monday August 28th, 4:00pm. 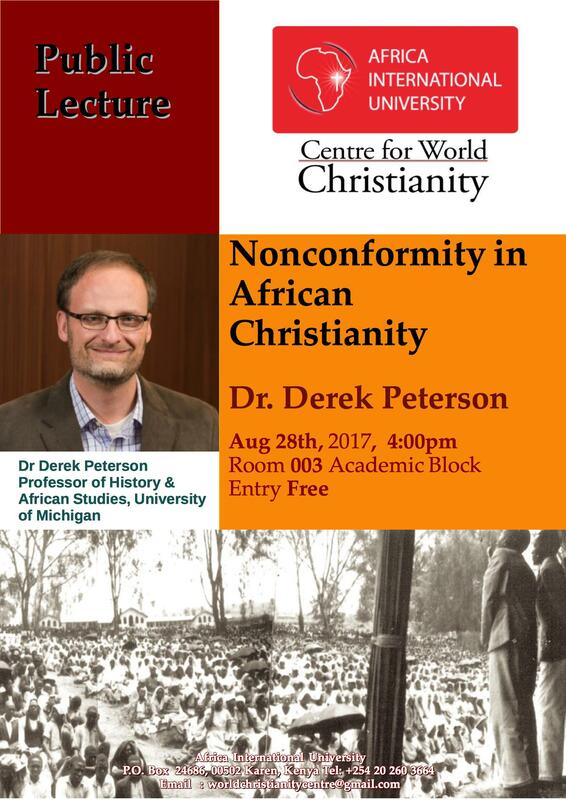 The Centre for World Christianity is pleased to announce a public lecture by Dr. Derek Peterson. The lecture will be at the AIU academic block Monday August 28th, 2017 at 4:00pm. Dr Peterson is author of "Ethnic Patriotism and the East African Revival: A History of Dissent, c.1935–1972" which won the Martin A. Klein Prize for African History in 2013 and the Melville J. Herskovits Award, African Studies Association, 2013. The book was also the runner up for the Philip Schaff Prize, American Society for Church History, 2013. Dr. Peterson teaches African history at the University of Michigan. He is a recipient of the Philip Leverhulme Prize for Modern History and a Fellow of the Royal Historical Society. CWC Alumni now President of University in DRC: Dr Georges Atido’s Journey of Ministry, Academic study and Leadership. Dr Georges Atido, an alumni of the Center for World Christianity at Africa International University, was in August 2017, appointed as the twelfth President of Université Shalom de Bunia in Northeastern Congo. Atido was born in an African Inland Mission station in Northeastern Congo. He grew up in a family that exposed him to Christian faith in his early age. “I accepted Christ as my Savior and Lord at the age of six and was baptized by immersion at the age of twelve,” he says. He and his siblings moved with their parents in different villages in DRC where their father, Rev Atido Kunde Dong’ went in his evangelistic and pastoral ministry. Atido’s father’s dedication to missions inspired George Atido from an early age to serve Christ. He developed a keen interest in literature which he studied in a public college in Congo. After graduating with a Master of Education in French and African Linguistics in 1998, he was invited to teach French at Université Shalom de Bunia. It was in this seminary where his urge for theological studies was kindled as his calling into full time ministry was reaffirmed. Atido and his family moved to Nairobi in Kenya in 2002 where he was enrolled for a masters in missions at Nairobi International School of Theology, (NIST) a seminary affiliated to Campus Crusade for Christ. “My faith in Christ grew significantly as God miraculously provided for my needs,” says Atido. Upon graduation, Atido’s family moved into inland Kenya where George served as pastor among the Kamba ethnic community with a Brethren church denomination known as The Fellowship of Believers (FOB). In 2007, Atido family relocated in Congo where Atido was appointed the Assistant to Dr Katho, then President of Université Shalom de Bunia. In 2009, Atido and his family returned Nairobi where Atido enrolled for a master of theology, followed by a doctoral program in World Christianity at the Center for World Christianity in Africa International University (AIU). “It was here,” Atido says, “I was introduced to sound evangelical theology, church history and missions related studies including Evangelical Revitalization Movement Theory developed by Professor Mark Shaw.” As part of my doctoral studies, Atido travelled to Edinburgh in Scotland to the Centre for the Studies of World Christianity where he enrolled for seminars in relation to his PhD research. “In Edinburgh I interacted with Andrew Walls, Brian Stanley and Afe Adogame who introduced me to important features of World Christianity,” Atido says. He graduated with a PhD in World Christianity in 2015 with a dissertation on “Religious Mobility and Identity among Alur Christians in Northeastern Congo” in July 2015. Atido and his family returned to Congo where he was appointed Executive Secretary to the President of the Université Shalom de Bunia. The following year Atido was appointed Associate Professor of Missiology and World Christianity and taught courses in master’s program and seminars for PhD students. He is also co-supervising a PhD dissertation at the Universite Shalom de Bunia alongside Hannes Wiher, a distinguished francophone professor of missiology in the Faculté Libre de Théologie Evangélique at Vaux-sur-Seine in Paris in France. His student is researching on the mission model of the “Communauté Evangélique au Centre de l’Afrique (CECA 20) in the Democratic Republic of Congo from 1912 to 2012. “My research interests include interrogating African indigenous expression of Christianity and their connectedness with African cultural, economic, social, and political context,” says Atido. His most recent research on this area includes a study done on a flourishing Congolese indigenous church known as Fraternité Evangélique de Pentecôte en Afrique au Congo (FEPACO.) This research was funded by The Templeton Foundation through the Nagel Institute for the Studies of World Christianity in 2016-17. The main findings of this work will be submitted to the International Bulletin of Mission Research (IBMR). Atido belongs to the Langham Scholar family in addition to his commitment to the Observatoire Interdisciplinaire du Religieux au Congo (OIR). Atido also serves in the editorial board of Africa Review of Interdisciplinary Studies (ARIS) based at Kinshasa. The Université Shalom de Bunia, was founded in 1957 by five Protestant evangelical denominations in eastern Congo. The school started as a seminary in 1961 then developed to a university in 2007. Université Shalom de Bunia provides accredited degrees in Evangelical Theology, Development Studies, Medical Studies, Management, Agriculture, and Environmental Science at both the undergraduate and graduate level to about 800 students. It opened inaugurated a PhD program in Theology in 2012. “My dream is is to see Université Shalom de Bunia producing Christlike pastors and professionals who will serve in the Democratic Republic of Congo and beyond,” says Atido. He adds, “my family will appreciate prayers as I embark in this new responsibility.” George and Jacqueline Atido are blessed with five children, Divine, Deborah, David, Daniel and Dora. This year’s graduation witnessed the graduation of Moses Owojaiye and Kyama Mugambi. These add to a growing number in the CWC community adding entering into the service of the church, academia and the African society as a whole. Moses Owojaiye is a Nigerian living and working in Nigeria. His thesis topic is "Images of Pentecostal Religious Functionaries in the Nigerian Christian Films: The Case of EVOM World Network." Of his experience at AIU, Moses wrote "learning from and with people of diverse cultural backgrounds have shaped the way I look at issues. This particular factor gladdens my heart and makes me recall pleasant memories of my time at AIU." Moses intends to start a Nigeria based research center with a global focus in the field of World Christianity. Kyama Mugambi, a Kenyan resides in Nairobi. The title of his research is "Leadership Development in Progressive Pentecostal Churches: Three Case Studies from Nairobi, Kenya" He said he has always enjoyed being a part of the diverse community at AIU over the years. About his PhD studies, Kyama wrote that, "it has been especially gratifying this season to be a part of the Centre for World Christianity, learning what God is doing here in Africa and around the world. I look forward to increasing my involvement with other scholars, and with the Centre." Kyama hopes to contribute to the growth of Christianity in Africa, in the development of leaders for our continent through academia and the church. Kyama Mugambi was invited to speak at the Great Commission Summit in Irvine California on June 22nd and 23rd 2017. The summit is a gathering of church leaders from the area to "teach, equip and connect pastors and church leaders to be effective ministers of the Gospel amid the changing dynamic of global Christianity." Together with Christian Mungai from Mariners Church, Irvine, Kyama shared about the features of discipleship at Mavuno church. Some of the discussion centered around how this discipleship from the global south has had a positive impact and inspired reflection and review among some churches and ministries in the US. AIU welcomed the Regent Vancouver team for their experiential African Theology course on June 10, 2017. This course is offered in Regent as a cross cultural learning experience which incorporates African Theology material taught through lectures, experiences and discussions over the course of two weeks. This year AIU is delighted to enrol 3 pastors into the course to share the experience with the Regent team. The course is taught by Dr Diane Stinton. She is Associate Professor, Mission Studies and the Dean of Students at the school. She is also an adjunct lecturer at AIU. She specializes in the study of world Christianity, particularly in theological developments in the global South. She has taught theology for many years in Kenya, where she helped launch two new programs at Daystar University and at AIU. She is the author of "Jesus of Africa: Voices of Contemporary Christology" and the editor of "African Theology on the Way: Current Conversations."